The Banded Ground-Cuckoo is a rare bird of Colombia and Ecuador. 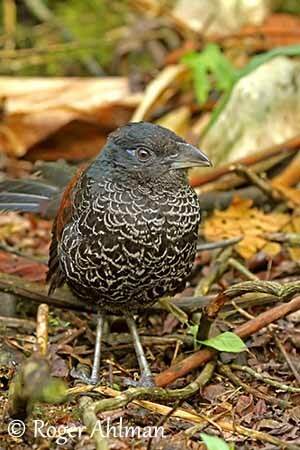 The genus Neomorphus is that of the large forest cuckoos of South America. This species is Endangered and threatened by heavy deforestation and hunting pressure. The adult has dark plumage above and below, mainly black with buffy-edged feathers, giving a scaly effect. The lower back is brown, finely barred black, whereas the rump is blackish-brown. On the wing, the wing-coverts are chestnut. The inner wing is purplish-red. The outer primaries are black. The long tail is black, and shows purplish and greenish gloss. On the head, crest and nape are black with dark green gloss. We can see a blue bare patch on the rear of the eye, and a bare blackish eyering becoming blue in breeding season. The eyes are brown. The strong bill has dusky upper mandible and yellowish lower one. Long legs and strong feet are bluish-grey. Both sexes are similar, and the immature resembles adults. 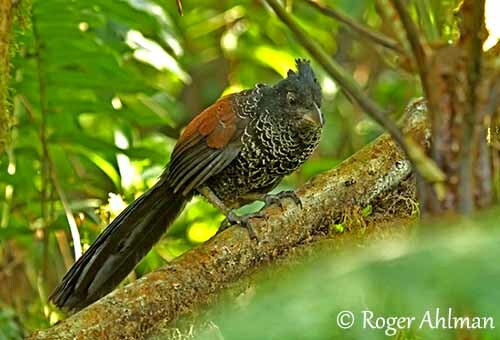 The Banded Ground-Cuckoo is found on the Pacific slopes of the W Andes in SW Colombia and NW Ecuador. It is endemic to the Chocó Biogeographical Region of South America. 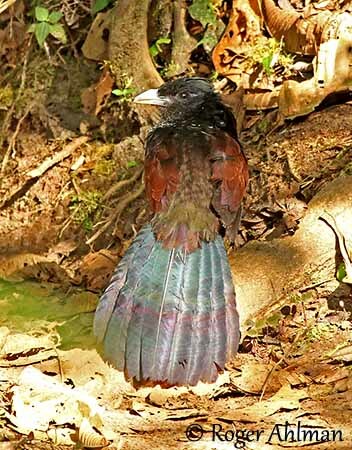 The Banded Ground-Cuckoo frequents subtropical and tropical humid forest both in lowlands and mountains, in foothills and lower slopes of the W Andes. This species occurs between 500 and 1200 metres of elevation. The Banded Ground-Cuckoo utters occasionally low-pitched, deep sounds “moo” similar to “moo” of a cow. 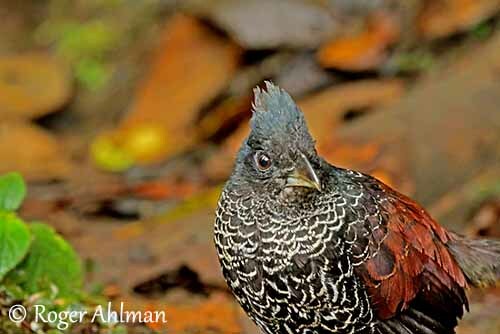 The New World ground-cuckoos use bill-pops, bill-clicks and chatters as signals, and especially in aggressive contexts. The Banded Ground-Cuckoo is mainly terrestrial, and thanks to its fairly long legs and strong feet, it usually walks on the ground while searching for preys. It often raises and lowers its crest while foraging. This species is known for following the swarms of army ants, but it also feeds on invertebrates (grasshoppers and crickets) disturbed by the ants. It may take some small vertebrates such as frogs. Lizards and small snakes are taken too. They are shaken to death before to be swallowed. 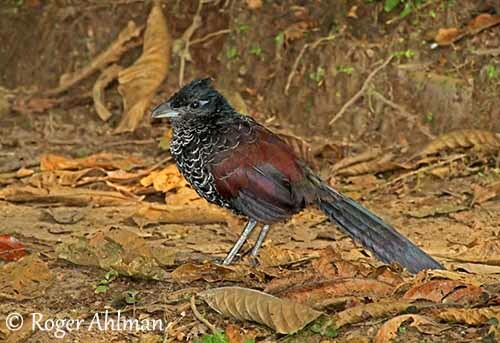 While the ants move along on the forest floor, the Banded Ground-Cuckoo waits on the ground or in low branches near the ground. Then, it runs at the edge of the swarm and catches an insect or other arthropod. It runs in active bounding movements and often changes of direction. It may occasionally flap to reach an elevated perch, but longer flight is uncommon. These birds feed usually separately, with only one bird following an ant swarm. However, if two ground-cuckoos are too close together, they often rush at each other while producing rapid bill-pops. Another aggressive posture shows the bird lowering the primaries and spreading the tail, probably as intimidation display. And then, one of the birds leaves the swarm. 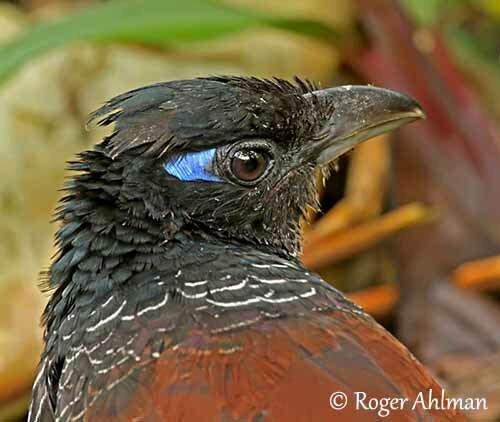 The Banded Ground-Cuckoo is not a brood parasite and both adults raise their own chicks. The breeding displays of this species are unknown, but we can suggest that the blue skin of the eye area is brighter and exposed, the crest is raised, and the tail pattern is enhanced by fanning and raising the rectrices. Some chases between mates probably occur too. They are socially monogamous. 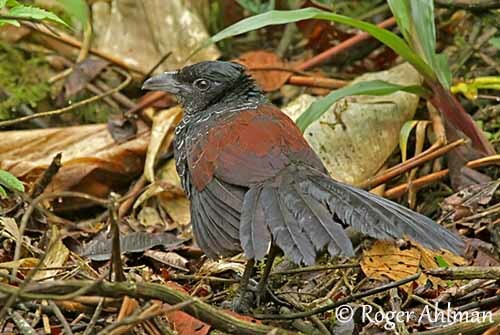 The Banded Ground-Cuckoo is resident in its range. Although being usually seen walking and running on the ground, it can fly. But it usually stays close to the ground, using only a hop or a flap to reach higher perches. The breeding season takes place between March and June. Recent observations provided for the first time some information on the nesting behaviour of the Banded Ground-Cuckoo. The nest is placed about 4/5 metres above the ground, in tree in the primary forest. The clutch size is small with usually a single egg. The chick is fed by both parents on wide range of invertebrates such as grasshoppers, and small vertebrates such as frogs. The Banded Ground-Cuckoo has small population estimated at 600/1,700 mature individuals, fragmented in smaller populations. This species is rare and local even in suitable habitat. The decline of this species is due to habitat loss with deforestation for logging, intensive agricultural development, and presumed hunting pressure for consumption, roads and gold mining. The Banded Ground-Cuckoo occurs in protected areas. Ecological reserves are protected against illegal logging, hunting and colonization within the boundaries. However, this species is currently listed as Endangered.